Unfortunately I will not be in Cincinnati during the season this year, but I did not discover that until after purchasing my season tickets as well as season parking. The seats are on the NFL ticket exchange, but that does not help me sell parking. Parking Lot D is just East of the stadium, with some covered parking under the Stadium Plaza, under Elm St and under West Freedom Way. Great lot for tailgating. I timed it one day in 2017 and I was able to walk from my car to the security at the East entrance gate in ≈ 2 minutes, 10 seconds, without having to cross any streets. 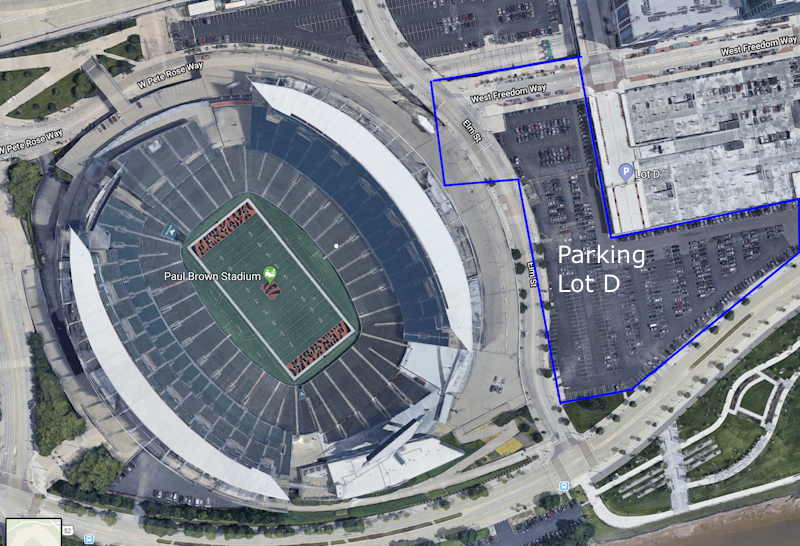 If you are sitting on the East side of the stadium, you can return to the lot even faster as you can exit at the parking lot level without having to return to the plaza level. This lot is sold out to season ticket holders and has a waiting list, so you rarely see them available for an entire season. I am willing to sell the full set of ten at $415 face value if anyone is interested. Here is an aerial view with Parking Lot D outlined in blue (some of the parking area is under the above streets). There are entrances from both West Pete Rose Way and Mehring Way. I would normally edit the original post to place the sold notification on line 1, but I simply can not figure out how to edit a post on this forum.